Does Your Homeowners’ Insurance Cover This? It’s a good idea to review your credit report at least annually. Many insurance companies use credit scoring as an underwriting criteria. Make sure yours is correct! Hello and welcome to the new Goplin Insurance Agency blog. After 63+ years in Richland Center, we’re still your full service, independent agency. Providing commercial, auto, home, farm, health, and life insurance, Goplin Insurance can help you with all of your insurance needs. It’s quite funny that the agency has a blog at all. Our office is located in one of the oldest buildings in Richland Center, just steps from the courthouse square. Four years ago brought the newest agent, Teresa Goplin, to the agency. Teresa represents the third generation of agents in the family business. Bringing a new generation’s views and needs to a business is challenging. While the need for insurance hasn’t changed, the way that it’s marketed and sold most certainly has. We look forward to moving ahead with societal advancements for those who have the need and option to contact us online and via social media. One of our first big changes to our overall marketing philosophy was a new logo. It was designed to be simple and eye catching. We think we did well. The second thing we did was update our materials. You will notice the new logo on all of our printed materials. The most recent – certainly the largest! – change we’ve made has been the new sign on the front of our building. It was installed at the beginning of September. The prior sign had been in place for over forty years. While the sign installation was in progress, there was much buzz generated about town! Our phone was ringing off the hook! People were commenting that a fixture of the main thoroughfare of town was no longer! Thankfully, to our delight, we have had nothing but positive feedback regarding our new sign. For those of you who still prefer a more personal approach, please stop and see us. Don’t be surprised if you get a bit of lively banter and local “news”! We look forward to new, exciting changes ahead. Our same quality of service will be in tact. We will simply be looking for the best ways to communicate with our current and, hopefully, future customers as well. 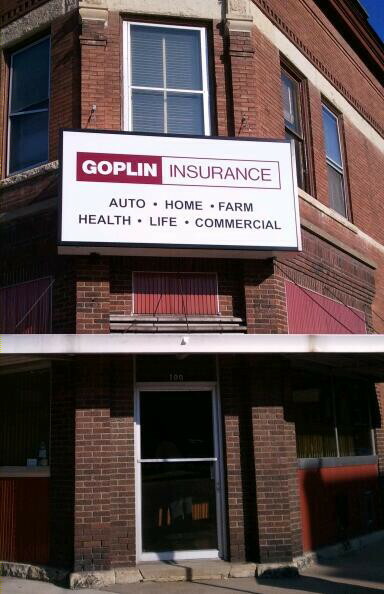 Like Goplin Insurance on Facebook!